This is the second Finnish edition of Tony Hillerman's A Thief of Time, which is the eighth book in his Navajo Mystery Series featuring Joe Leaphorn and Jim Chee. This version was published in 1998 by the Finnish publishing house, Otava in Helsinki, Finland. This edition was translated from Tony Hillerman's original text in English into Finnish by Jyri Raivio. 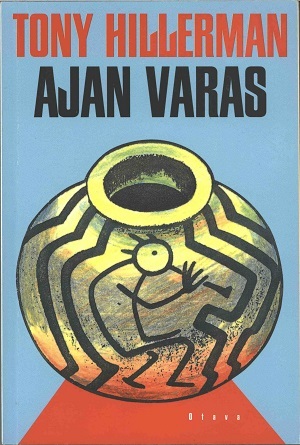 The cover art adapts the image of a black-on-white ceramic vessel featuring the image of Kokopelli on a light blue background from Peter Thorpe's cover for the first edition of the novel. Format: Paperback, 19x 12.7 cm. Binding: Full-colored paper covers with the author, title, and publisher printed vertically on the spine.